Palm oil is in about half of all packaged products in supermarkets, and is found in a variety of types of items, including items ranging from lipstick and toothpaste to donuts and bio-fuel. 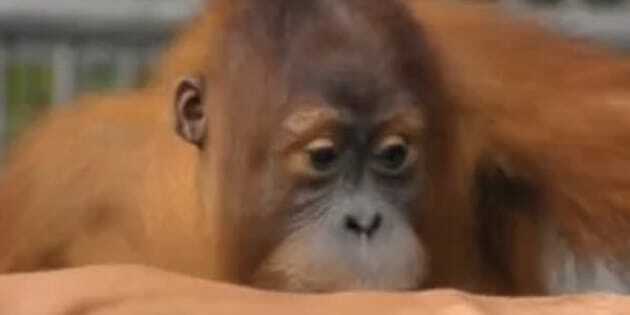 The palm oil industry poses a huge threat to orangutans and other species. The World Wildlife Foundation points out that Indonesia and Malaysia produce more than 85 percent of the world’s palm oil, and those countries also serve as the only homes left for orangutans. The animals live under the constant threat of deforestation and the destruction of their homes. And that’s not the only byproduct of palm oil production. As forests are cleared for palm oil plantations and roads are constructed through protected areas, poachers gain easier access to areas that were previously difficult to reach, The World Wildlife Foundation notes. This further fuels the illegal wildlife trade. And this is what happened to Chocolate, Shayne McGrath, Leuser Ecosystem Conservation Director of Wildlife Asia, told The Huffington Post. McGrath said that as a result of the deforestation from the palm oil industry, poachers were able to take Chocolate from the Tripa peat swamp, a forest inside the Leuser Ecosystem expanse in northern Sumatra, which is densely populated with orangutans. The ape was found at a house in a local village, where he was severely malnourished after living on rice. But after SOCP took Chocolate in, giving him medical attention and helping him learn skills to survive and live independently in the wild, the orangutan was released. Chocolate is now living in the Jantho Orangutan Release Site, a protected area of rich lowland forest, the SOCP site notes. It also has an an unusually high density of fig trees, which happens to be one of the orangutan’s staple foods. Hopefully one day, Chocolate’s story won’t be quite so rare.